As organizers, we believe in Autonomy, Strength, and Solidarity. 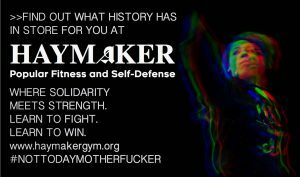 Because we believe in autonomy, we know that we must learn to fight our enemies without relying on institutions that disempower us and macho gym cultures that weaken us. We must learn to fight for ourselves. Because we believe in strength, we know that we must be stronger than those who want us to suffer or wipe us out completely. We must learn to be unafraid as we become a force capable not only of self-defense, but of social transformation. Because we believe in solidarity, we know that our personal transformation is at once collective transformation and that an injury to one is indeed an injury to all. We will learn how to keep each other safe as we become dangerous together. If you want to toss them some duckets, find their indiegogo. If you’re inspired to work on something like this in your town, hit them up at haymakerchi@riseup.net or on the fedbook or twitter by their handle @haymakerchi. This audio will make it into a full episode coming up soon. So, if you feel like passing the hat or holding a fundraiser or hitting up Daddy Warbucks himself, George Soros, for them please do. If you enjoyed this episode and you get our show from the itunes library, drop us a review, rate us 5 stars and help spread this show. Also, if you like hearing our podcast and want our interviews to make it to the cars, trucks, jail cells, basement apartments and everywhere else in your area, consider hittin us up and help us figure out how to get on your local community radio. Our shows are an hour weekly, are free for stations and people to download and are radio clean. Right now we’re airing in Columbus (OH), Asheville (NC), Olympia (WA), Santa Rosa (CA) & Fairbanks (AK). Why not YOUR home town?